^ "Weavers' Way footpath closure — Decoy Road (Hickling) to Potter Heigham 7 January 2011 – 6 April 2012". Countrysideaccess.norfolk.gov.uk. Retrieved 2013-05-17. ^ "Indus River Valley Civilizations". History-world.org. Retrieved 2008-09-12. ^ "Hao Zhang, Hajime Nakagawa, 2008, ''Scour around Spur Dyke: Recent Advances and Future Researches''" (PDF). Dpri.kyoto-u.ac.jp. Retrieved 2013-05-17. ^ Arosio, Diego; Munda, Stefano; Tresoldi, Greta; Papini, Monica; Longoni, Laura; Zanzi, Luigi (2017-10-13). 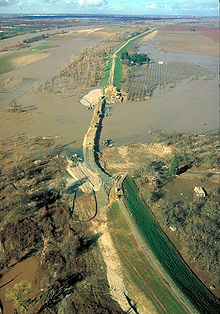 "A customized resistivity system for monitoring saturation and seepage in earthen levees: installation and validation". Open Geosciences. 9 (1): 457–467. Bibcode:2017OGeo....9...35A. doi:10.1515/geo-2017-0035. ISSN 2391-5447.